This website aims to conform to web accessibility guidelines in order to ensure that the website is accessible to users with a range of disabilities, including those with visual impairments. To contact any of our partner organisations please click here to find their page for more details. As part of our user testing phase we are inviting you to send us feedback on this website. click here for the feedback form. We look forward to hearing from you and will get back in touch as soon as we can. Find information about copyright here. 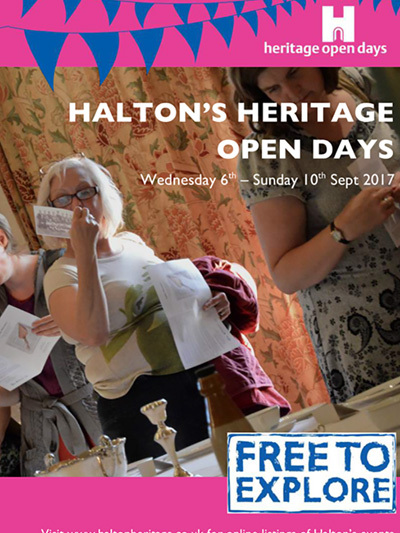 Halton's Heritage Open Days… Coming Soon! Heritage Open Days is an annual, national event that sees groups, organisations and buildings open up their heritage treasures to the public. All events and activities are FREE to attend, so what’s not to love?